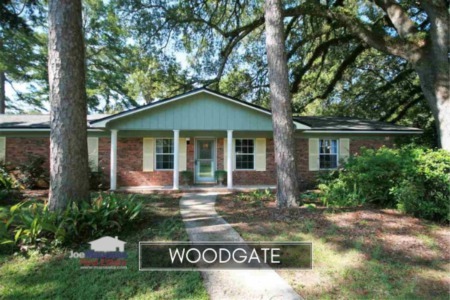 Located inside of I-10 and along Thomasville Road, the various Betton neighborhoods (Betton Hills, Betton Hill, Betton Woods, Betton Estates, Betton Place and Betton Oaks) have long been favored by Tallahassee home buyers. 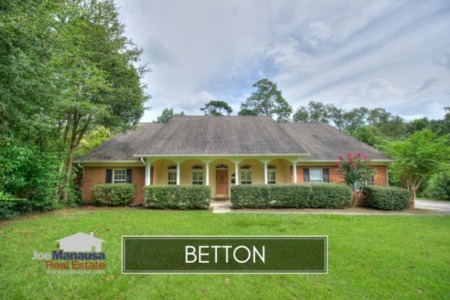 The Betton neighborhoods have wonderful parks and homes built from the late 1940s through the early 1990s, though occasionally new homes have been built since that time. 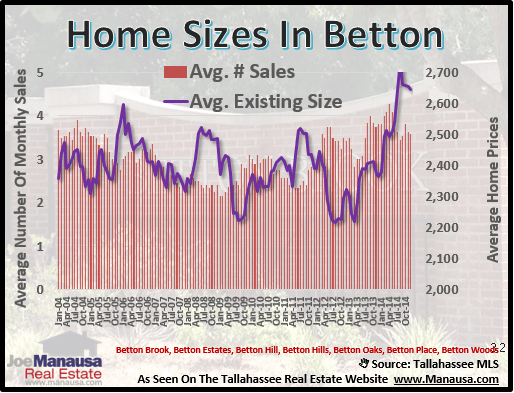 In this report, we will look at prices, values, and sizes of homes in Betton, as well as show current listings in the Tallahassee MLS and all closed home sales going back to 2003. For each of the three real estate graphs found in this report, you will find the number of closed home sales for each year (blue columns, measured on the left vertical axis), and an important real estate statistic shown in red (measured on the right vertical axis. It is important to note that sales are through December for all previous years, but through mid December in 2014. 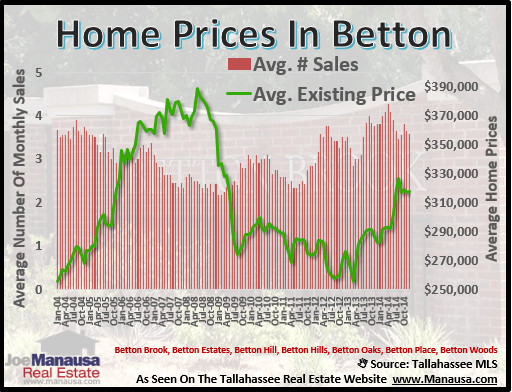 Average home prices have been recovering in the Betton neighborhoods for the past two years, up until about six months ago. Home sales activity this year is robust, where the number of home sales has been higher than the most active years from 2002 through 2006. As far as the Betton neighborhoods are concerned, the recovery is here and they are just waiting for prices and values to return. The following table shows how each neighborhood of Betton is recovering. The first column shows the current value, the second column shows the highest average monthly value posted in the past 12 years, while the third shows the lowest average monthly value of the past 12 years. The fourth column compares the current value with the peak of the market, while the final column compares the current value with the bottom of the market. By way of example, this shows that Betton Estates is currently at its market bottom. 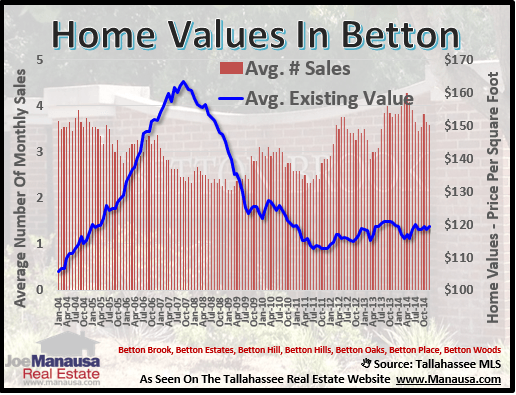 Average home values in Betton are up this year, though the rate of appreciation is just above zero and even slightly lower than the summer values of 2013. Through mid December, the average value of a home sold in the Betton neighborhoods has been roughly $120 per square foot. You can look at the table above the graph to get current values in each Betton subdivision. I hope you enjoyed our December 2014 update on home sales in the neighborhoods of Betton, please feel free to drop me a note if you have questions not covered in this report.